One of my favorite herbal allies, especially during the iwnter months is Olive Leaf. It is a fantastic herb known for it's ability to kick flu viruses, bacterial infections - even yeast overgrowth. The olive is a small evergreen tree native to Mediterranean regions, but naturalized to climates as varied as those of Australia, California, and Texas. The well-known green to blue-black fruit of this tree yields a useful, edible oil. Both the oil and the dried green-grayish colored leaves are used in herbal medicine. 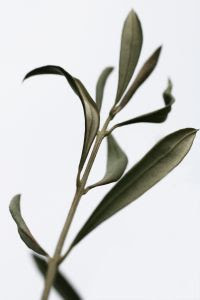 Olive leaf teas have been used for thousands of years to lower fevers, and olive leaf poultices are among the oldest therapies for infections of the skin. Olive leaf contains a compound called oleuropein acid that is an effective immune system tonic. The oleuropein in olive leaf is a natural wide-spectrum antibiotic, anti-bacterial, anti-viral, and anti-fungal. Unlike synthetic antibiotics, it destroys only the bad bacteria and protects the good. Olive leaf also contains the active ingredient Calcium enolate, which is directly responsible for supporting healthy phagocytosis, the immune system function in which phagocytes in the blood engulf and digest harmful foreign micro-organisms. Olive leaf is effective against many viruses, bacteria and fungi and has been used to treatviruses like Epstein-Barr disease, Chronic Fatigue Syndrome, Herpes and even AIDS. It is said to be effective against even antibiotic resistant bacteria, yeast strains and fungi. Olive leaf's powerful anti-bacterial and anti-viral agents are often found useful in cases of yeast and fungal infections, herpes, chronic fatigue, allergies, psoriasis and many other pathogens. Olive leaf extract also has broad-spectrum antimicrobial properties. Oleuropein has been shown to have an impact against infectious and virulent microbes. Olive leaf also contains at least twelve powerful antioxidants which help protect the system from harmful free radicals. Since it works like a broad-spectrum antibiotic, it is also used for colds, flu, and upper respiratory and sinus infections. In addition, it has been shown to lower blood sugar, normalize arrhythmias, inhibit oxidation of LDL (the bad cholesterol), and relax arterial walls, thereby helping to lower blood pressure. Olive leaf appears to work by inhibiting the replication process of pathogens, which disables infections long enough for the immune system to eliminate it and keep it from spreading. The standardized extract is ideal because it contains at least 20 percent of active ingredients. The traditional dosage is 500 mg to 2,000 mg a day. Olive leaf tea should be taken with meals. Safety of the herb during pregnancy has not been established. Some people get an upset tummy if they don' take it with food. In our family we've never had any problems. We LOVE Oliveleaf!!!! Haven't used antibiotics in years. This stuff kicks all the flus and colds going around. Olive Leaf is one of my favorite herbs also. It has helped us with candida, viruses, even toothaches. It's also anti-parasitic. NFN - I've heard other people say they had good results killing yeast with olive leaf. We used it for pinworms when my kids were in dipes. Worked really well.